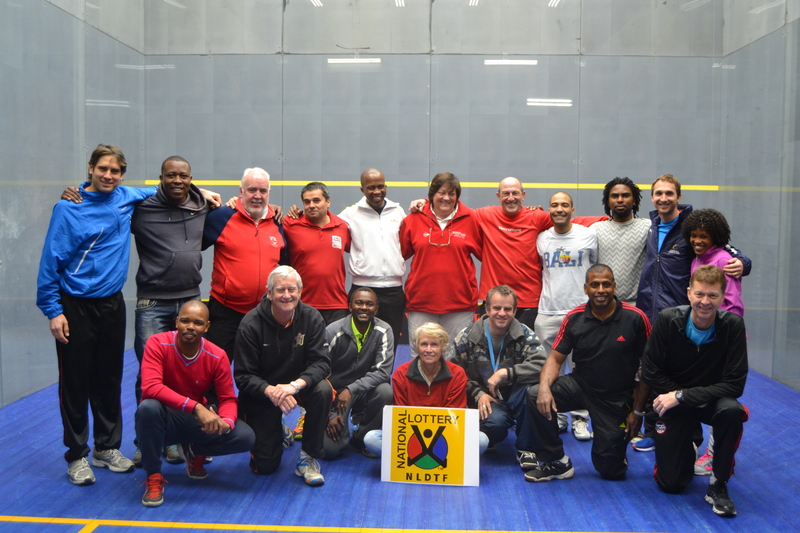 Squash South Africa co- hosted a highly successful and productive World Squash Federation Tutors’ and Level 1 Coaching Course at the Wanderers Club, Johannesburg from Friday 17th to Sunday 19th July 2015. As effectively as he parried his opposition’s strategies when a participant on the PSA circuit, Michael Khan, now chair of the WSF Coaching committee, mentored, facilitated, and guided his diversified group though 3 days of thought provoking presentations. Some of Squash South Africa’s most experienced coaches will be appointed as National Tutors and African Tutors viz. Graham Prior, Alan Stapleton, Mike Bester, Gary Plumstead, Alan Colburn, Mike Bester, Liz Mackenzie and Sally White. In the future they will be involved in presenting course to aspiring coaches in Africa, as well as fulfilling an even more valuable role in South Africa. Recently qualified Level 2 coaches: Mike Tootill, Gary Wheadon, Ravi Govender, Jason Le Roux and Munro Montanus will become National tutors pending an assessment of their presentation abilities under the mentorship of one of the National/African Tutors. The delegates from Botswana showed lots of potential, learning much from the exposure to South Africa’s top coaches and the valuable input from Michael Khan. Left to right: Back: Gary Wheadon, Tumi Tsalaesele, Graham Prior, Michael Khan, Moses Tshiamonyana, Liz Mckenzie, Alan Stapleton, Munro Montanus, Kago Matlapeng, Jason le Roux, Lady Leburu. Front: Koketso Nstshebe, Mike Bester, Simon Magogwe, Sally White, Gary Plumstead, Ravi Govender, Mike Tootill. I am interested in level 1 squash couching course.How do I become part of these exciting course? Can a Foreigner partake in this coaching course? Hi Mike, this took place a long time ago. You can contact the Squash SA office for information about possible upcoming courses. Check on the contact page for details.